Indigestion affects at least 50 percent of women during their pregnancy. Digestive problems may develop during the second trimester, but are likely to be more exacerbated during the third due to the pressure of the growing baby on the stomach. Increased hormone levels are the main cause of indigestion during pregnancy. They relax the stomach muscles, which causes food to pass through the digestive tract more slowly. 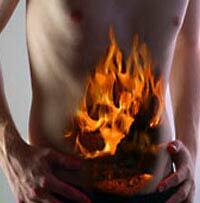 This makes stomach acids rise to the oesophagus, promoting reflux or heartburn. Food sitting in the stomach can also trigger bloating and indigestion. Overweight women are more inclined to suffer from indigestion during pregnancy as the excess weight puts additional pressure on an already squished tummy. • avoid the following foods, which are known to stimulate heartburn: – fried, fatty or acidic foods – hot, spicy or heavily seasoned foods – tomato-based products – citrus fruits and juices – cheese just prior to bedtime – peppermint—peppermint tea is good for digestion but is not a remedy for reflux – vinegar, chocolate, carbonated drinks, tea and coffee. • milk and yoghurt are said to be useful for reflux.